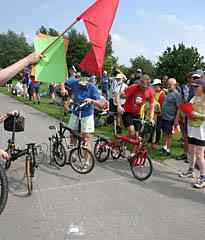 CycleFest is probably best described as the alternative cycle event - there are lots of recumbent bikes, recumbent trikes, Moultons, Pedersens, folders etc, but relatively few conventional diamond-framed bikes. 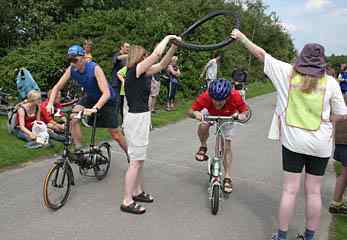 The first CycleFest was held in 1994, and the first three CycleFests were held annually, after which the event was only held every other year, so although it is 10 years since the first CycleFest, there haven't been 10 CycleFests. The event is held at the beginning of August, which should mean reasonable weather, but some people who might wish to attend may be unable to do so due to holiday arrangements. 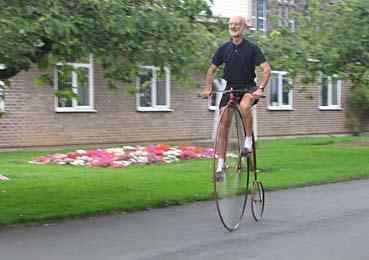 Sadly, this is described as being the last CycleFest - at least for the foreseeable future. 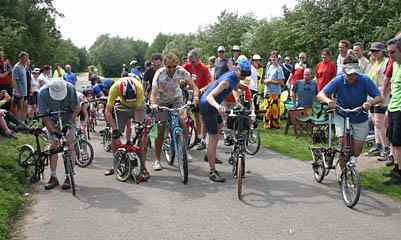 However, for CycleFest fans, there may be a new event of a rather similar kind next year in Northumberland - more on this at the end of this report. 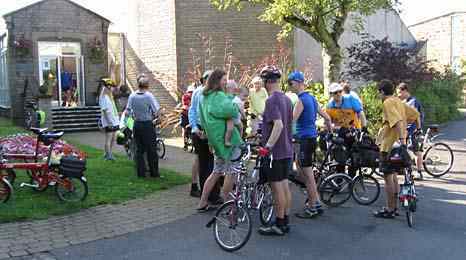 CycleFest is held at St Martin's College in Lancaster, close to the city centre, and a self-contained campus, with accommodation in halls there, camping facilities, and everything needed, all without leaving the campus. Now with additional photographs by Pat Douglass from the Saturday and Sunday. I hadn't actually been planning to go to CycleFest this year - I've enjoyed it in the past, but other commitments (including a Brevet Populaire which I had booked to ride on the Saturday) and cost had made me decide against it. However, I then found that I was down to lead the Folder Ride, so my plans had to be changed to fit it in. 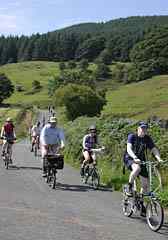 Pat Strachan kindly sent me some suggestions for a route for the Folder Ride, and I went up by train the week before the event to recce the route - using the SP Brompton. For the event itself, I decided to drive there and back, which is cheaper (given that I had the car), makes it easier to transport luggage without being too restricted in what can be carried, and gives more flexibility in time of travelling, not only to the event, but back as well. Nevertheless, I'd really rather save stress and strain, and the environment, and travel by train, and I normally do this, but the railway companies don't make it easy. People start gathering at CycleFest on the Wednesday evening of the event (4th August), and the ultimate end is early on the following Tuesday, but to save on the cost of accommodation (I chose to use the on-campus accommodation, as I'm afraid that I now find camping unattractive) I decided to travel up on the Thursday morning, and leave after the rides on the Monday. As I wanted to do the long ride on the Thursday, and I understood it was starting at 9:00, I had to make an early start (about 5:30). Everything had been packed in the car the previous evening - basically one folder, some photographic gear and a bag containing clothes etc. I finally decided to take the Airnimal Chameleon - adequately portable to take in the car and on the train journey which formed part of the Folder Ride, but with plenty of gears (it's a hilly area) and very enjoyable and fast on the road. 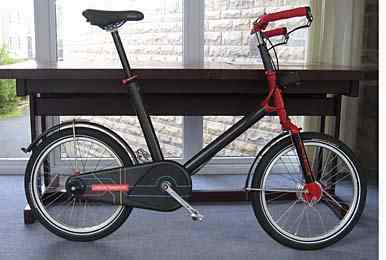 If I'd still had the Dahon Jetstream XP test bike, I might have been tempted to take that instead, but in the end it was fortunate that I chose the Airnimal, as I'll explain later. Ideally, if there had been room in the car (a Smart, so there is not a lot of space) I might also have taken the SP, to give a choice, or the Airframe, for pottering around locally. The Airnimal went into the car fairly easily, just using the fairly simple and quick 'first fold', and turning the handlebars through 90 degrees. The luggage compartment separator needed to be folded down, but the passenger seat was left upright, and everything else fitted around the bike, or in the foot-well in front of the passenger seat. The drive up to Lancaster was uneventful - an advantage of the very early start was that there was much less traffic than there would have been later. I arrived in good time by 8:15, but of course for morning travel, if I'd left 15 minutes later I would probably have been more than half an hour getting to Lancaster, and the traffic would have made driving much more stressful. I booked into my accommodation, and unloaded the car, and then registered at the CycleFest Reception, where I found that the ride would not start until 9:30, so I had more time to spare than I had expected. 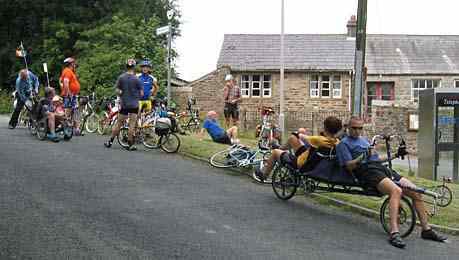 The long ride was described as 40 miles and hilly, going to Slaidburn via the Trough of Bowland. 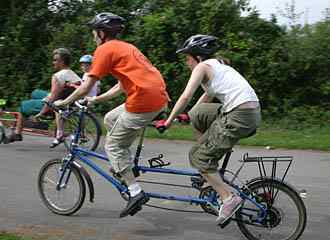 About 20 people opted for this ride, the majority on folders with a recumbent bicycle, a recumbent back to back (MicWic) recumbent tandem, several recumbent trikes, three Moultons (two AMs and an F-frame with a huge chainring) and a couple of conventional bikes making up the balance. 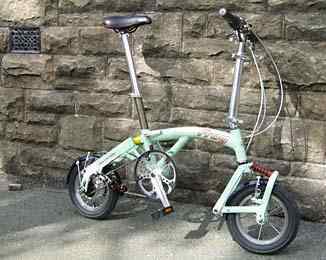 The folders included a Dahon Speed TR(? 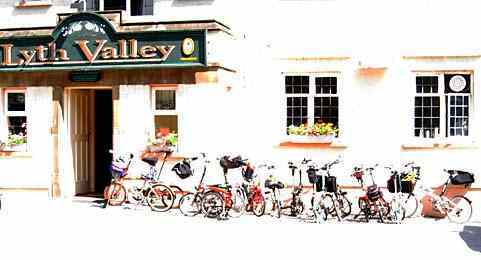 ), SPs, Bromptons. A couple of Bike Fridays and two Airnimals (the other one was actually my previous Airnimal!). The ride to the lunch stop can best be described as VERY hilly. Above left: Taking a much needed breather after one of the hardest ascents. Right: starting the descent that followed - the sign refers to the descent, but gives some indication of what we had just climbed. 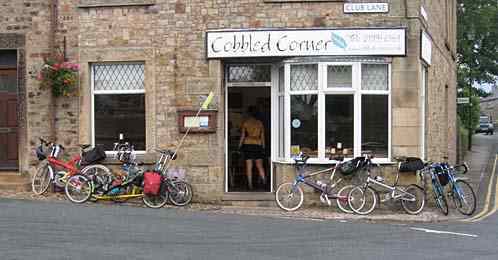 Above: The lunch stop at Slaidburn, just before we started on the return leg of the ride. Below: One of several pauses to regroup during the return ride. The MicWic recumbent back to back tandem (seen in the foreground) was frighteningly quick, not just downhill, but uphill as well, as least in the hands, or legs, of these riders. An impromptu tea stop coincided with a heavy fall of rain (most of us got there before it, but not everyone). The rain seemed to have abated when we emerged, but just as we were about to start off, it came down again. One group had time problems, as they had commitments for the evening, and shot off immediately, while the others were still kitting up in their rain gear. From there on, in initially light rain, things became rather chaotic - no fault of the ride leader, but those who could manage to go faster felt inclined to get back to Lancaster as soon as possible, and not get any wetter. I stayed with the main group for a while, but then decided to press on - I'm not a fast rider, but my shortcomings are more than compensated for by the performance of the Airnimal Chameleon. I spent most of the time from here on riding on my own, eventually hauling in one of the riders from the group which had started early from the tea stop, and even catching Paul Stobbs soon before the A6 (well, he HAD stopped to put on his cape, and consult the map, and he had 4 panniers!). The last bit of the approach to the A6, 8Km or so, was a joy to ride on the Airnimal Chameleon - the weather was wet and miserable, but the Airnimal just flew along, and I was really glad of the higher gears (after being very glad of bottom gear several times earlier). 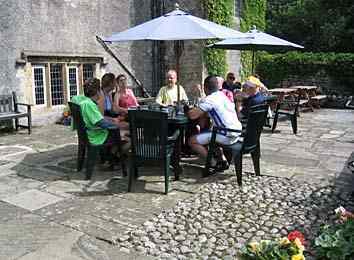 Above: The unplanned tea stop in the late afternoon was very welcome, and took place just as the rain was starting. I arrived back in Lancaster at about 18:30 (our lunch stop was not particularly protracted, which gives an indication that it was a fairly hard day) - those who left the tea stop slightly earlier arrived about 15 minutes before me, but a number of the group arrived later, and unfortunately got caught in MUCH heavier rain than I experienced. Due to the late return, and general lack of energy after what is, for me, a fairly hard day's riding, I'm afraid I did not attend the evening talk. I didn't sleep especially well - apart from the high temperatures and humidity, after a long hard ride I often seem physically stressed, and can't relax. There were long and short rides on offer, plus a late option of a hilly(!) ride to Dent. Hardly surprisingly, none of those who did the long ride on Thursday chose this (good to see folders, in the form of Birdys, to the fore at the start of this ride though). Long Ride Leader Patricia assured us that this really would be about 40 miles, and NOT hilly, to Arnside. I wouldn't dream of disbelieving her, but as my recce for the Folder Rid the previous week had been through this area (on the return), I felt reasonably confident in choosing this ride. We rode into Lancaster, and then picked up cycle routes to the canal, which we followed for some distance. This towpath has a hard surface which puts to shame (in terms of ease of cycling) any other towpath I have ever ridden, and indeed very many roads. The only problem was a stout motorist who had driven his car down the towpath, parked half on the towpath, and then unloaded all his fishing gear and sat down to fish alongside the car, and seemed very resentful that any other person should wish to use the route , sounding off about how he had a licence (to fish, there perhaps, but drive the car too?) and we hadn't (speaking for myself, I did have my cycling permit with me). 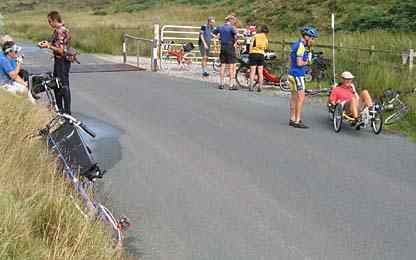 Cycles could squeeze through, but the recumbent trikes must have had more problems, and no doubt upset this gentleman even more. I suppose the most surprising element of this encounter was that he had got out of the car at all, and wasn't fishing out of the car window. Speaking of trikes, there were more recumbents than on the previous day's ride, but again lots of folders of various kinds, Bromptons and SPs again being conspicuous in terms of numbers, but Dahon, Bike Friday and Airnimal were again represented. Once off the canal towpath, we followed quiet roads, which were pretty flat, to Arnside, where we stopped for lunch. 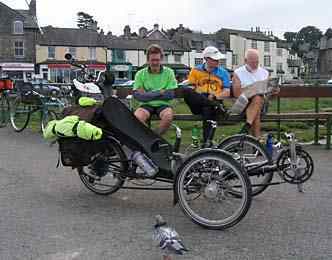 At this point Ann Coulson's recumbent bike was found to be on the verge of a terminal tyre failure, so it was arranged to get it on a train back to Lancaster - not nearly as easy as hopping on a train with a folder! Still, it was fortunate the failure occurred on this ride, rather than the previous day (when Ann was leading the ride), as at least we were right by a station, with a simple route back to Lancaster. A few of the riders relaxing during the lunch stop. The pigeon was not on the ride, but evidently hoped for some crumbs from lunch - I think it was out of luck. After lunch the route was distinctly more hilly in places, though not to compare with the Thursday ride, but it included an excellent tea stop at Borwick Hall. After the tea stop we followed a route which eventually joined my planned optional folder ride back to Lancaster, the final stages of which followed the Lune Valley cyclepath into Lancaster. Here a lot of the group shot off to do shopping etc, so it was a very small and select group which finally rode together to the college after a most enjoyable day,. The weather was excellent throughout - verging on too hot. 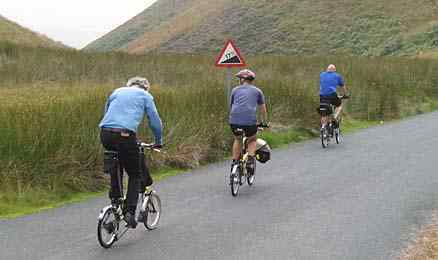 Above: stopping to regroup after descending a hill which had been preceded by a steep climb. The evening talk was by the people from MicWic, who produce the frighteningly quick back-to-back tandem which had taken part in both the long rides. I'm afraid that again I didn't feel motivated enough, and energetic enough (after the previous day's ride), to attend. The day I was dreading finally arrived - I really hate leading rides, particularly in terms of feeding stops, as generally I won't make such formal stops riding on my own, and I'm content/prefer just to eat a banana and/or a cereal bar rather than go to a caf�/pub etc when riding on my own. During the recce, I only passed one possible lunch stop, and hadn't managed to confirm that they would accept us - though they certainly appeared to have the required capacity, and notices about walkers removing boots implied that a group such as ourselves would not be unwelcome. At least the weather was good first thing - always a worry, even if there is nothing you can do about it. About half of us rode to the station as a group, and by the time we were all gathered I was staggered to find that there were 38 of us - at least double the number I had expected. It was a relief to find that Paul Evans and Susan Barlow had arrived in good time - they had come up by train from Birmingham specially for the ride, and according to the train timetable should only have arrived a few minutes before we were due to depart, but oddly they had been there for a considerable time (surely not a train running early?). Dave Minter would no doubt have been with them, but for the fact that he was involved in the running of the Brevet Ride which I had been planning to do back in the Midlands, so he couldn't get away for this ride. 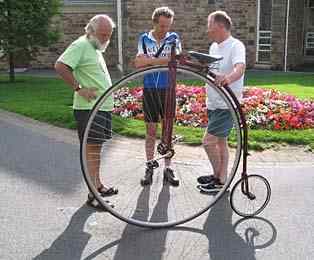 On top of this, there was a couple with a Tandem Twosday in a case and a Birdy who were waiting for another train for places further north just starting their holiday. Such large numbers are pleasing in one way, but do pose more problems in terms of getting on the train, avoiding losing anyone etc, and stopping to regroup becomes a real problem, as it all too easily will block a road and create hazards for the group and others. We all managed to get on the train - many thanks to the absolutely excellent support of the train staff, who did everything they could to help us all get on. During the train ride to Grange over Sands the train was full, but with only a very few people standing, so the presence of the bikes was not an embarrassment, and other travellers seemed amused and interested rather than of the kind who are determined to moan about anyone else enjoying themselves. Disembarking at Grange over Sands took a few minutes, but again the train staff were very helpful, and it was then a case of unfolding for the ride. 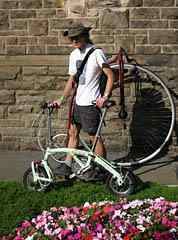 Those with Bromptons were at an advantage in terms of folding and unfolding, but the Chameleon folded and unfolded reasonably easily (certainly not the slowest, nor the least compact when folded). 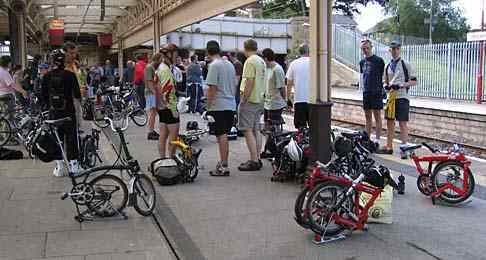 Fortunately the station had toilet facilities, so those with non-Bromptons were able to wash their hands if they had managed to get dirty during the folding/unfolding process. As we had made a fairly late start - availability of trains at a suitable time was a problem - it was about 11:00 by the time we were ready to leave Grange over Sands, and in order to be at the only possible lunch stop at a suitable time, elevenses had to be omitted. The route that Pat had planned for us was almost entirely on quiet lanes - just a short distance on more major roads, but even these had only very light traffic. Much of the route was very flat, though there were about 4 short sharp hills, where, as expected, some people chose to push, and we stopped at the top of each such hill to regroup. The bikes included many relatively standard Bromptons, SPs, Birdys (various colours), Dahons, a Bike Friday, a couple of Airnimals, a Giant Halfway, a Micro, a Gekko (heavy, one rather low gear and tiny squidgy tyres, but going remarkably well thanks to the determined efforts of the rider) and even a very old U-framed BSA. There was a Frog at CycleFest, but regrettably it was not on this ride. Not surprisingly with such a very large group (38 - but this was apparently nothing compared with over 70 on the non-folder ride! ), it took a bit longer to reach the lunch stop than I had expected. The stop was certainly very welcome when we reached it, as it had turned into an uncomfortably hot and sunny day. Although the hotel did not seem to have any fundamental problem in handling such a large group, service was very slow, and some people had finished their food before other had even received theirs. As some people, especially Pat and John, who were organizing events such as the race up the drive back at the college later in the day, needed to get back, and after the planned 15:29 train from Arnside there was not another until 16:19, the group split during the lunch stop, with some setting off earlier in order to be able to catch the earlier train. 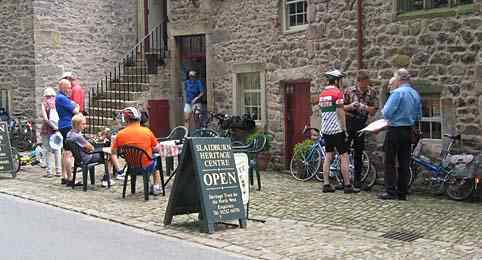 In fact, as the lunch stop dragged on, a second group split off to make their way back, some having decided to follow a different route and take in a repeat of the Friday visit to Borwick Hall and Cream Tea, and ride all the way back to Lancaster. The remaining group which I finally lead away from the lunch stop at 14:45 was therefore much reduced in numbers, and obviously was not going to reach Arnside in time for the 15:29, and quite possibly would not get to Arnside in time for the 16:19. Above: The lunch stop and just a few of the bikes - the bright light and lack of attention on my part results in the left hand picture being enormously over-exposed! Despite the heat, another three short sharp hills (otherwise pretty flat), and a less pleasant couple of kilometres on the A6, the last of the riders eventually got to Arnisde in comfortable time for the 16:19, and joined up with some who had gone on ahead. I decided to ride all the way back to Lancaster; two others took a break in Anrnside and then rode on to Silverdale to catch a later train, but the rest took the train from Arnside. At least by having split into two groups the numbers on each train were less of a potential problem than on the outward journey. My solo ride back to Lancaster was entirely uneventful, and I arrived at the College at just after 17:30. This coincided with the delayed start of the race up the drive (and it IS definitely UP). Rather than get involved in this, I added a loop to enter the college via a different route. All the riders completed the route without any significant physical problems, and there were no mechanical problems with the bikes either. The performance of the Gekko and the old BSA, and of course their riders, deserve particular praise. A lot of the ride had been quite flat, though of course it's impossible to avoid some hills in this area. A nice feature of even the flatter parts was that there were some great views - tempting photographically in more interesting weather conditions. Pat really had found a superb route for us, for which I'm very grateful. It was a pity though that the actual ride leadership was not up to standard, for which I apologise. Many thanks to everyone who came along and took part in the ride. 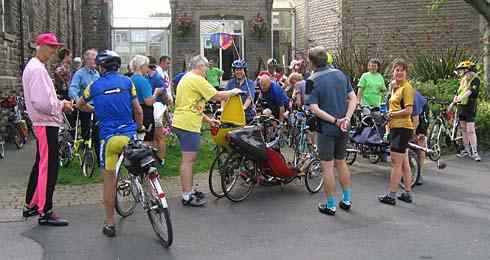 The Saturday evening talk was to be given by Inspired Cycle Engineering - the Trice recumbent tricycle people. 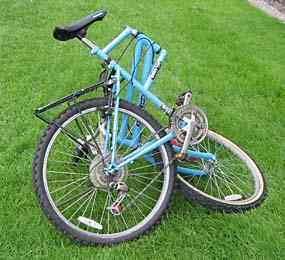 These are beautiful looking machines, and at past CycleFests I have ridden one around the campus on test, and lusted after one. This year there was no trade show, so I didn't get nearer to one than seeing people riding them on the various rides and around the campus, but the talk was obviously a must, and it provided a lost of interesting history of the machines, and the huge number of different models that have been produced, and indeed are still being produced. 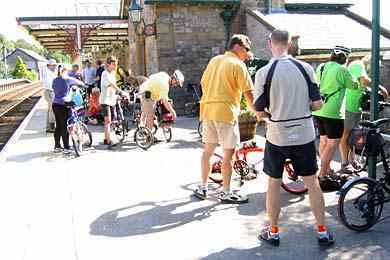 The Sunday of CycleFest is the day for a short ride to Morecambe for various activities on the sea front, and a return via Salt Ayre, where there are serious and much less serious races. As I'm a rather unsociable person, I decided, as at most previous events, to go off and do a ride by myself, heading out to Pilling and Garstang - fairly flat. It was once again quite hot and sunny, but today there was quite a strong and gusty wind. I couldn't help wondering how the faired recumbents were faring if they encountered one of the gusts in the form of a cross wind. After a fairly gentle ride I made my way back into Lancaster via the cyclepath which leads to Glasson Dock, but managed to get lost as I left it, at one stage completing a circle which resulted in me riding the whole length of this path twice on the way back, as well as once on the outward leg! 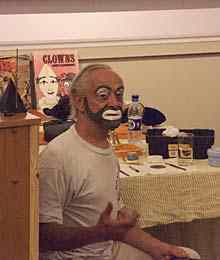 I was able to have a short rest before the cream tea on the terrace outside the social bar, where Bo the Clown also put on a show for the kinds (and some of the older people too). 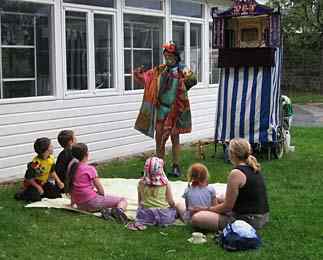 Bo was also to be the speaker at the evening session that day, talking about clowning in general. 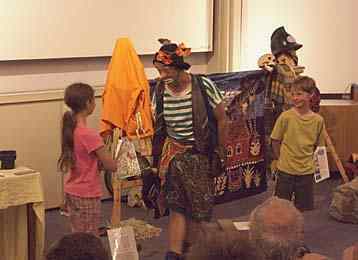 This was a wonderful performance - hilarious, and just the right note on which to finish the main part of this CycleFest, or I suppose ALL CycleFests. 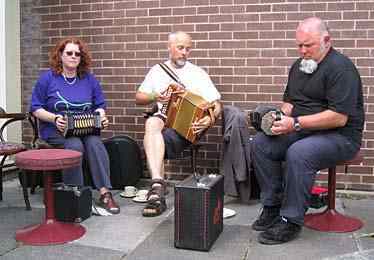 Many thanks to Derek for providing such superb entertainment. Many people are unable to stay after the Sunday, and so the Monday is basically just a ride to wind the event down, with an evening session in the bar, and then a final clear up early on the Tuesday. My plan had been to do the Monday ride, then drive home. I was looking forward to the ride (route still not finalised before the day), but when I woke early on Monday it was pouring with rain. As the ride start time approached, the rain stopped, and the sky lightened a bit but it was still very wet, and the weather forecast was extremely bad - torrential rain expected. In view of this I reluctantly decided to give up the idea of the ride, and to set off home soon after 9:00, which would have the advantage (I hoped) of less traffic and hence easier travelling, and arriving home in time to unpack properly, clean the bike and car, and do some urgent work needed to prepare for a visit on Tuesday to the university to complete some financial returns for the academic year which were needed by the end of the week. I'm not sure how the riders got on for weather, but I certainly encountered the torrential rain on my drive home, and at times the traffic was very slow moving on the Motorway. Otherwise, though, there were no problems, and I got home safely at lunch time. 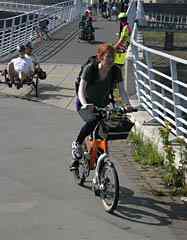 Above Left: Stacey and the Go Bike. Centre: The Sunday Parade at Morecambe. 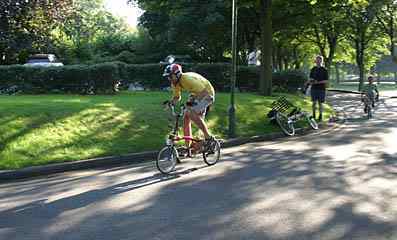 Right: Robert and Miriam Poole in the tandem race. 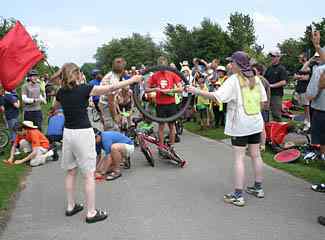 Above: During the race - stop and the red flag, re-fold the machine, make a paper aeroplane and throw it through a tyre, and then remount and finish the race. CycleFest has always been a very special event, and this year's was certainly no exception. I don't have any numbers, but it seemed very well attended - perhaps more people than in 2002. The rides were certainly well supported, and I think this was probably the biggest CF Folder Ride ever with 38 participants, certainly a lot more than at CF 2002, and at least double the number I expected. Folders were everywhere throughout the event, and this was particularly noticeable on the Thursday and Friday - the recumbents did not become very evident until the weekend, perhaps because that is when the formal HPV racing takes place. Bromptons were not surprisingly by far the most common folder (or indeed cycle of any kind), but there was also a good showing from SPs (Steve himself was at the event with both one of his usual converted Brompton frames with hydraulic disc brakes and a Rohloff hub, and his own short-wheelbase machine), Birdys, Dahons (significantly more numerous than in the past), Bike Fridays and Airnimals. There were a few examples of less common models as well, such as the Frog, Micro and Gekko. On the other hand, Moultons seemed much less numerous than in the past. 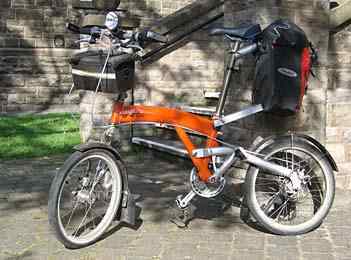 I didn't come across any folding recumbents, even though several SatRDay owners were there (but using other machines). 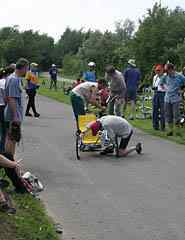 I believe there may have been a folding recumbent tricycle - the Greenspeed GT3, at the racing events on Sunday, but I didn't go down there, and much to my regret didn't get to see this. Above: The cycles present at this event vary considerably - some brave people tried riding the ordinary: not surprisingly, Paul Stobbs seemed quite at ease with it. Below left: The Go Bike is a rather uncommon folder - not particularly compact when folded. Below right: I suppose this might be considered a folder too! There was no trade show this year - I can easily understand why not, but I for one missed the opportunity which it used to provide for testing other machines - in fact, apart from my own bike, the only other machine I got to ride at all during the event was the SP, which I rode once around the campus. 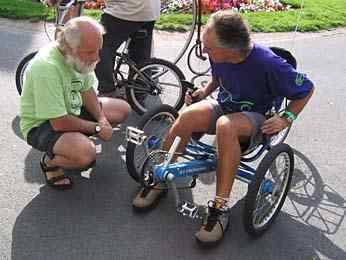 Still, the absence of the trade show may have been a good thing for my bank balance, though as always at and immediately after CF I feel tempted by a recumbent trike; fortunately in the past, after a few days or weeks, practical considerations have dispelled the cravings. I'd particularly hoped that the new Airnimal models, the Joey and particularly the Rhino, would be there to look at and try, but sadly that was not the case. I'm hoping to get more information on these in the not too distant future, and I know one person who has a Rhino on order, so I hope that there may be more to report on the web pages soon. 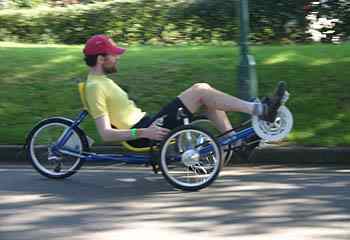 Incidentally, I noticed in one report on last year's PBP ride a reference to the fact that Richard Loke used a prototype Airnimal recumbent on that event. Perhaps the absence of the trade show on Saturday was one of the reasons why the rides that day, including the Folder Ride, were so well supported. Above left: Mike Burrows in conversation with John Bradshaw. Right: The 2D is a recent Mike Burrows creation; as the name suggests, it folds into a thin package, but quite long. On a personal note, my Airnimal Chameleon performed superbly throughout. On the way up, I did the simple first fold and turned the handlebars through 90 degrees, and fitted it and the rest of my luggage into the Smart with no trouble, though I did put a couple of things in the passenger footwell to avoid squashing things in the back. On the way back I didn't bother to turn the bars, and folded the passenger seat down instead, which left me with lots of free space (it's slightly awkward to get the bars in with the passenger seat in place, unless they are turned, though it can just be done). I was really glad I chose this bike - the very testing ride on the Thursday needed all the low gears and high gears, and the very free-running of the bike was much appreciated. With this bike, although it was a hard ride, it was still enjoyable. With any of my other bikes it would have been much more of a struggle. The other rides were easier, and the Chameleon was an absolute joy to ride - effortless and great fun. 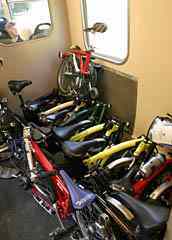 Even folding for the train journey was no great problem, and if the bike was rather larger when folded than the Bromptons, it was still easy to get it on the train. It was entirely down to the Airnimal that I never had any trouble keeping up with other riders who I know are much stronger than I am (well, they probably were riding quite gently by their standards as well!). As always, this CycleFest was a huge success, and many thanks are due to Pat and John for all the work that they put in to it - it is a very happy mixture of good organisation and informality. Thank you both, and all the rest who were involved in making the event so successful. 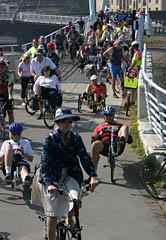 It's hard to come to terms with the fact that this was the last CycleFest ever (or at least in the foreseeable future). 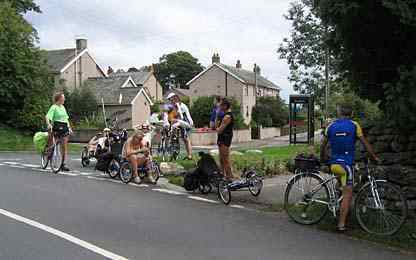 However, the good news is that the well-known cycling photographer (much in evidence at CycleFest, on a Brompton) Jason Patient is apparently planning a new event, CycleFeast, for August 6-7th 2005, to be held in Northumberland. I failed to find one of the forms to record my interest during CF, but I've made contact since, so when more information becomes available I will put it onto the web pages - so look out for this.